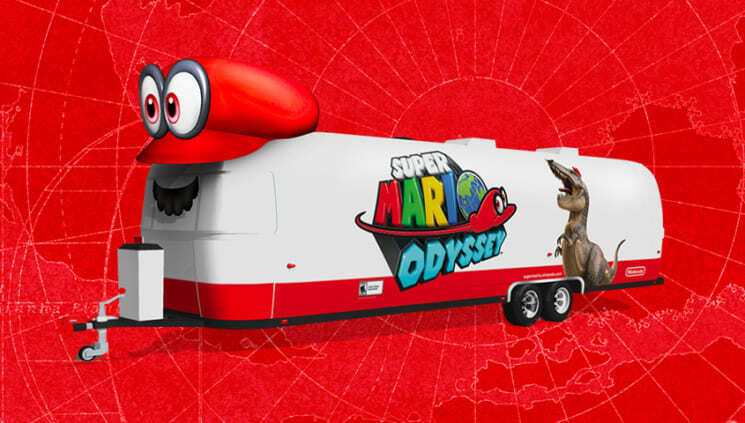 Mario and Cappy will be holding a cross-country tour in a trailer to promote Super Mario Odyssey for the Nintendo Switch. Before the release of Super Mario Odyssey, Nintendo will be holding a cross-country tour around the USA to promote the much-awaited game. Since the game is about exploration, it is appropriate that the tour is also about exploring different key cities. This cross-country tour is held using a specially designed trailer. This trailer features an inflatable Cappy as well as Mario’s signature mustache. The trailer will have a demo copy of the Super Mario Odyssey game inside, and people can take photos with Mario and the trailer. This cross-country tour will start in Los Angeles at Universal CityWalk on October 10 and ends in New York on October 26. A Mario costumed character will also be at the tour and visitors can take photos of him. Mario will visit five cities, namely Los Angeles, Dallas, Chicago, Philadelphia, and New York. Each stop is a “kingdom”, a homage to the Super Mario Odyssey locations such as Seaside Kingdom and Sand Kingdom. The last stop, New York, will be a much larger event. People can join and celebrate the early release of Super Mario Odyssey in the Rockefeller Center. The first 200 in line will get a chance to purchase the game earlier than the expected launch date, so this is truly exciting for die-hard Super Mario fans. The New York stop will be next to the Nintendo NY Store, so fans can also purchase other special merchandise in the store. Super Mario Odyssey comes out on October 27, 2017 exclusively for the Nintendo Switch. There are also three amiibo Figures releasing on October 27, so make sure you can get them if you can. In addition, they also have a special bundle on release which has a special carrying case and two red Joy-Cons.